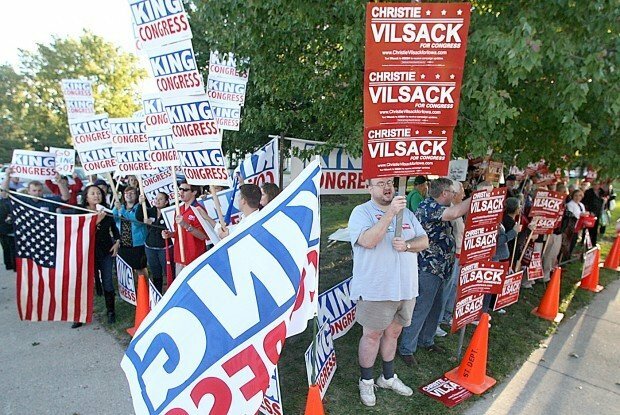 Crowds chant in support of Steve King and Christie Vilsack before their debate Monday night in Hampton. The Winsor Theatre was home to Monday night's debate between congressional candidates Steve King and Christie Vilsack. Steve King speaks during Monday night's debate. Christie Vilsack speaks during Monday night's debate. The marquee of the Windsor Theatre in Hampton before Monday night's debate. HAMPTON — Christie Vilsack said Monday night she will be a problem- solver rather than a partisan fighter if she wins election to Congress. U.S. Rep. Steve King, who Vilsack is challenging in the November election, said the destiny of America is at stake in the election. “Either we follow the Constitution or we follow the current leader who has turned the other way,” he said. “We have a president who doesn’t believe in the Constitution, he doesn’t believe in life and he doesn’t believe in families,” said King. He said the best way to get the country back on track is to repeal “Obamacare,” pass a balanced budget amendment and strive for energy independence. 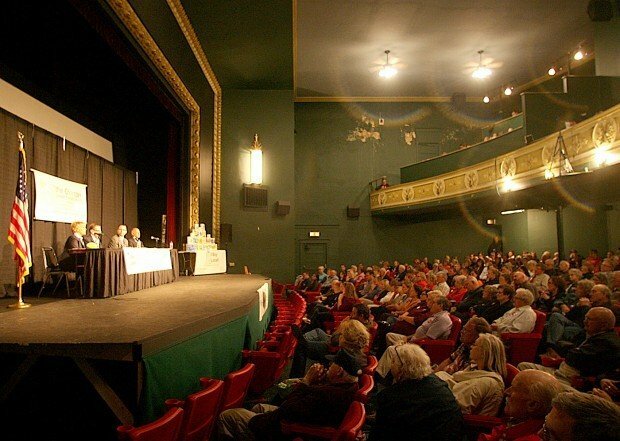 The debate was held at the Windsor Theater and lasted a little more than an hour. Vilsack was on the attack much of the night, peppering her remarks with claims of King’s lack of leadership on almost every issue discussed. Most of the themes King and Vilsack touched on were familiar. “There is no part of it worth keeping that would be more important than repealing the whole thing,” he said. Vilsack said it is a good bill but has some flaws. She said coverage of pre-existing conditions and keeping young people on their parents’ insurance until age 26 were good provisions. Addressing the federal deficit, King said two things need to happen to bring it under control. “We’ll balance the budget when we have a president and Congress willing to do it — we need to stop sending spenders to Congress — and we have to have a balanced budget amendment,” he said. “It is kicking the can down the road,” she said. The key to balancing the budget is having people in Congress who know how to compromise to get things done. She said King has done little to try to balance the budget. “He supported two wars we didn’t pay for and he has voted himself pay raises five times,” she said. Regarding job creation and growth, Vilsack said the rest of the nation could take a lesson from Iowa with its job market in wind energy and renewable fuels. “Create products made from plants rather than petroleum,” she said. King said high tax rates and too many regulations are intimidating employers. “And in order to have jobs, you have to have employers,” he said. Vilsack said people need to know one big difference between King and her. “He wants to promote his agenda; I want to promote your agenda,” she said. King, 63, of Kiron, owned a construction company when he was elected to the Iowa Senate, where he served six years before being elected to Congress in 2002. Vilsack, 62, taught middle school and high school language arts and was a resident of Mount Pleasant when her husband, Tom Vilsack, was elected Iowa governor in 1998. He is now U.S. secretary of agriculture. She is seeking public office for the first time. This post is disturbing to me - and it certainly is not the first one with this level of disdain for other Americans by this poster. It is beneath someone who is well past adolescence and purports to be a fine upstanding patriotic American. Todd, I have no alternative but to dismiss whatever points you would like to make on this forum if this is how you start out. Your parents must be so proud of you. What a despicable person you are Todd. No wonder nobody likes you. Ugh. Wow, Todd. That's pretty offensive, even for you. Wonder what you would have said about the Asian woman if she had been on the Vilsack side of the photo. He looks typical Iowan to me, Todd. King offers no solution to our healthcare problems; he offers no support for those people looking for work other than start your own business; he offers nothing that is substantial other than the same old Republican mantra of cut taxes on the rich and there will be jobs. Not happening. 'Kady', I'm not a racist - and my comments had to do with personal responsibility, and how Democrats often don't make wise use of their time. Most guys with beards are liberals, and ALL women with beards are liberals. This dude, who clearly has time to protest Congressman King, and promote Vilsack, could better use that time working out, couldn't he? It's not like he must work all the time, because he has time for this. And as earlier pointed out - DARK socks with TENNIS shoes? THAT'S ... dorky! If you are as hard working as you say you are. How do YOU have the time to comment on every story in the Globe? Was Republican Abe Lincoln a Liberal? I believe he had a beard. What is a pasty faced punk with hollow eyes? Oh, that's right. A loser. 'OneBall', I disagree with your claim that King "offers no support for people looking for work", other than encouraging them to "start" their "own business". King has never voted to repeal unemployment insurance, or various programs already in place to help such people. He's a successful entrepreneur, and the BEST advice IS to start a small business! Small business means JOBS! We need MORE Iowans to go out and put in those 18-hr days, and start signing the FRONT of paychecks, not only the BACK. Those percentages might work if you left only one comment per article. That not even getting into the time you must spend researching all the FACTS(and I use that term very generously)that you quote. I would say maybe you as a conservative has a problem wasting time. 'Pro' asked if Abe Lincoln was a liberal. 'Pro', to show you just HOW liberal Lincoln was, he was to the LEFT of the DEMOCRAT who ran against him, not only for the Presidency, but also for the U.S. Senate! Lincoln was also to the LEFT of the other man (a former U.S. Senator) who served as President here in America at the same time as Lincoln did. The era of Big Gov't actually began under President Lincoln - so, yes, history proves that old 'Honest Abe' WAS a liberal. Even BEFORE he had a beard! All of our bearded presidents, Abraham Lincoln, Ulysses Grant, Rutherford Hayes, James Garfield, and Benjamin Harrison, were Republicans. Hmmm I don't see much facial hair on Obama. He must be a conservative. When you judge people on looks alone Todd you miss so much. Would you have dismissed Einstein as a moron because of his wild hair & stash? In reply to 'poff': I actually don't spend any time "researching" facts: once I read them, they're sort of stored, internally! 'Scot' - oh, come on! I've read comments here where bloggers who'd seen my photo said I "even look like a neo-N-ZI, right down to the blue eyes", and other such remarks. It's not like this is a serious forum. I'm serious when reporters call me for a quote, and when I pen an editorial, and when candidates ask me for help on fundraising, and etc. THIS forum isn't that way! Oh, so YOU get to determine the level of seriousness of this forum on behalf of all others. How convenient for you. YOU get to take gratuitous shots at others - based upon their appearance - and WE just have to let you have your fun???? Vilsack endorsed Obama's GM bailout, at which the IPO share price was $33. Today, shares trade at $24, and if the gov't sold them now, taxpayers lose $15 BILLION. Profitability is nowhere on the horizon, as the Union now calls the shots. GM's share price needs to hit $53 for taxpayers to break even, but no sale will occur until after Michigan's and Ohio's EV's are safe for Barry. Union liabilities, gov't fleet-mileage rules, etc, guarantee long-term UNprofitability.Vilsack supports this WASTE. And King doesn't even support his own state. As you may have heard, since you're such a super good reader, is that he's the ONLY one who won't sign off on the farm bill. Nice, huh? Some advocate for your CONSTITUENTS. Or perhaps - could it be - he's just a partisan weasel? Since the GM bailout was not a failure, and every economist in the world acknowledges that, you'd better find another dead horse to beat, Todd. King's "take no prisoners" attitude toward abortion and health care make it very difficult to pull the level in front of his name regardless who his opponent is. Todd, perhaps you should step away from the computer for awhile. Your posting was nothing short of ugly and judgmental; which is how Rep. King sounds most of the time. I'm sure you were very happy viewing the Republican National Convention where there were pretty much just white men & women. Your false assumptions re. my views,which you inaccurately assume are somehow racist, exemplify the "ugly and judgmental" aspect of politics that you CLAIM to deplore. FYI, I was for Herman Cain, and I'd love to see Clarence Thomas, Walter Williams, Thomas Sowell, and Congressman West of FL in federal appointive office. I've NEVER not supported anyone over their race, creed, gender, or sexual preference. You - and most liberals - fail to recognize your own, rampant hypocrisy, and judgmentalism. Todd-you are arguing with yourself. Not very well, but still arguing. Not so, 'T-Kid': 'Iowan53' falsely says the GM bailout wasn't a failure. Sure it was. GM's assets should've been sold, and - under U.S. law - the bondholders should've neen paid first. That's how things work. Instead, bondholders got cheated out of what was rightfully ours, and Obama bailed out the Unions. He also f---ed over the non-union employees, and dictated to mgt decisions which were properly the board's to have made. No intelligent reader can "argue" with this, because that's how it was. Sorry, Todd, but it was a success. Jobs were saved and the company is expanding. I hardly think that's a failure. As usual, you cannot back up your big mouth. In fact, I DARE you to prove it was a failure - and remember, facts are REAL statements you can PROVE. Todd-I repeat. You are arguing with yourself and not very well. You seem convinced that your school of thought is the only one out there. You seem convinced that the republican Party didn't get us in this mess in the first place with tax reductions while fighting two wars ,"off the books". You are a huge part of the problem, not the solution that you so want to be. 'nuf said. I repeat you argue with yourself and convince no one. 'Kid', I challenged Iowan53's claim that the GM bailout was successful, and I presented facts to prove my point. Not only were bondholders cheated, but GM would NOT be successful today if the law in place at time of purchase had been properly followed, and enforced. It's impossible to understand how you can claim that my facts countering the nonsense posted by 'Iowan53' is arguing with myself - but you're welcome to believe what you want. That's the liberal way, after all: IGNORE fiscal REALITY. Come on, Todd. What "facts"? That something "should have" happened? Not a fact. That some workers got "screwed over"? Not a fact. Woulda shoulda do not a fact make. I deal in facts, not the swirling vitriol that belches from your damaged brain. King won't sign off on the farm bill petition. He's the ONLY one who won't. Why? His constituents need and want it. Is it because he's a partisan weasel and doesn't give a rat's behind about Iowa? Is it because his income has been multiplied by six since he got in office and he'll sell his first born to keep this job? Could it be that he's a blight on the state? Let's hear you twist this one, Todd. Todd-There is a show on NBC called Last Comic Standing. You should try out because you are hilarious. Of course you argue with yourself, but in your own egotistical way you don't see it and you label everyone who disagrees with you a liberal. You sir are a hack with nothing better to do than attack those who disagree with you. You always have and I've got a feeling you always will attack others because you can't formulate a cohesive opinion, except one forwarded by the hijackers of the R party. 'TK', I don't use any "forwarded" stuff in my posts: my thoughts/views are my own. You've been proven wrong by Iowan53's reply to me, which, btw, failed to address the valid points I made re. how GM bondholders were cheated by Obama's bailout, and that were it not for bondholders being stiffed, GM wouldn't now be profitable, and how the long-term prognosis for GM's profitability is anything but good. Note that I-53 didnt' even address those points. Is this what you call not "a cohesive opinion"? I SAID you need to post facts that back up your foolish claim that the bailout wasn't successful. You still haven't! GM bondholders are not the country! GM bondholders are a finite number of people! The bailout saved thousands of jobs! When you "invest" you are taking a risk - the "bondholders" lost. The employees, and the country won! Boy, Todd, your myopic view of the country is never more clear than your premise that a handful of wealthy people losing some money is bad for ALL of us! Who are you talking to? I suggest you come back tomorrow when you're sober. Todd- "my thoughts/views are my own". Thank you for making my point that you nothing more than a delivery system for the extreme right. The GM bailout isn't over yet you harp about it endlessly, while missing the "point" that the extereme right got us into two wars that cost trillions. I repeat TRILLIONS, yet you rag on about billions that will be repaid eventually. Get a grip. If I'm not mistaken the article was about the King/Vilsack debate. Stay on point.